Frustrated by your sluggish and unresponsive PC? Soluto is bringing an end to PC user frustration with transparency, killer technology, and your help. The same statements can be found on the webpage of soluto. Soluto (anti-frustration software) will accomplish the above in three (3) ways namely: chop boot time, lighten web browser and heal crashes. For this feature, we will take a look at the "chop boot" functionality. In order to accomplish this you will need to download soluto. 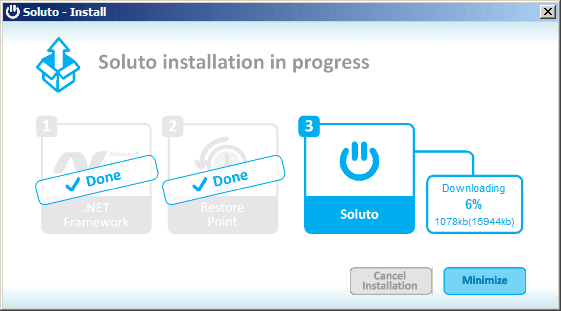 Then launch soluto installer. The software will download the latest soluto application to the local drive. The download is a bit hefty so be patient while the software downloads the required packages. Soluto will then ask for a reboot and detect the software installed. During the reboot it will profile the performance of the computer during boot-up and detect the software being launched. Then it will download a few other software, which could probably be the genome database or a part of it. This will take another while to load. 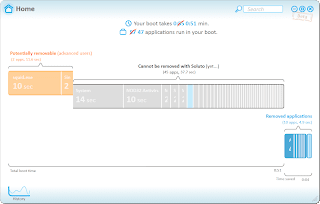 Soluto will then present the result of the boot profile including suggestions on which software can be disabled, paused or delayed. It also identifies which software are not safe to be tweaked. While tweaking, you are presented with the list of software that can improve boot time and the potential impact on cutting boot time. This also includes a suggestion on how the other soluto users set the service or application boot-up settings. Using soluto can be help out a lot since it uses the power of the crowd of soluto users to see the best configuration for your computer. 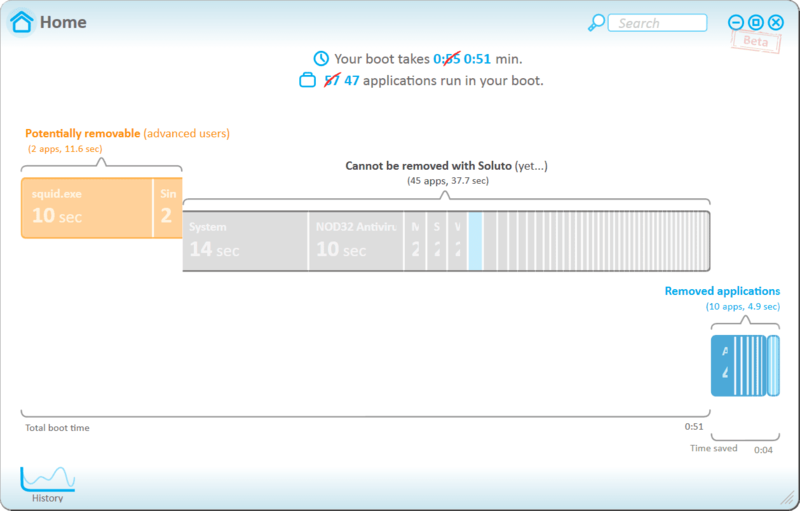 Rest assured, you can always do a trial and error as soluto creates a backup of your original boot-up configuraion. And restore them in the future if you want to back out changes. On my desktop, I shaved off around 4 seconds by delaying or disabling startup applications and scripts. From a boot-up time of 0:55 down to 0:51. That is achieved by delaying the start-up of 10 applications and services. My desktop is already optimized so the impact is quite lower. Your mileage may vary. So go ahead and try out soluto on your system. Try out this tweak to boot Windows 7 even faster.